Bored of serving up the salads in a bowl? Does it look daunting for you to eat an entire bowl? We have just the solution in the form of tomato stackers. So get out all the cold salad ingredients, slice them up thin, stack ‘em and crunch on them as a snack or as an entree. Note: And anything you would normally put into a cold salad that can be sliced thin, such as onions, cucumbers, peppers, your favorite cheese, carrots, radish, mushrooms, whole leaves of your favorite green leafs etc. Starting with a tomato slice, place ingredients in any order you’d like. Be sure to end with a tomato slice on top and then drizzle the herbs. 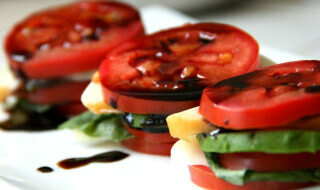 Top your Tomato Stackers with oil and vinegar. Sprinkle with salt and pepper to taste. Red Wine versus White Wine: What’s better for your heart?